Primary liver cancer is one of the most common aggressive malignancies, which presents a serious threat to human health . Hepatocellular carcinoma (HCC) is the major histological subtype among primary liver cancers, representing over 90% of total cases of primary liver malignancies . China is home to more than 50% of the word's HCC patients [3, 4]. Hepatitis B virus, Hepatitis C virus, and nonalcoholic fatty liver disease are major contributing factors to this high incidence of HCC . Treatment options for HCC include surgery, chemotherapy, radiation and liver transplantation. However, high incidence of recurrence and poor prognosis still prevail, particularly for patients with advanced HCC. Therefore, it is imperative that we better understand the molecular pathogenesis of HCC in order to develop more effective treatment options for HCC patients. Notch signaling plays a significant role in both normal liver development and liver tumorigenesis . The available data that the role of Notch signaling in HCC were controversial. Some reports suggest that Notch signaling functions as a tumor suppressor in HCC. Notch1 can induce apoptosis HCC cells by altering the balance between B-cell lymphoma-2 and p53 . Consistent with the finding, upregulated p53 expression induced by Notch1 enhanced HCC cells to sensitive to tumor necrosis factor-related apoptosis-inducing ligand-induced apoptosis . Furthermore, activation of Notch signaling reduced cell proliferation and tumor growth of HCC by inactivating the retinoblastoma pathway . However, more evidence supports the carcinogenic role of Notch in the development of HCC. Notch1, Notch3, and Notch4 are commonly overexpressed in HCC, with Notch3 and Notch4 detected in 78% and 68% of HCC tissues, respectively . Activated Notch signaling has also been shown to promote liver tumor formation in mouse models . Upregulation of Notch1 signaling can also increase the oncogenic potential of human HCC cells . Due to the involvement of Notch signaling in HCC proliferation, invasion, and metastasis, numerous studies have demonstrated the potential of Notch as an HCC therapeutic target [13, 14]. This article reviews the advances in understanding Notch signaling and its pro-tumorigenic role in HCC, as well as the current progress in targeted therapy. Notch signaling is composed of receptors, ligands, and DNA-binding proteins. At present, 4 transmembrane Notch receptors (Notch1, 2, 3, and 4), and 2 families of Notch ligands (Jagged-1, 2 and Delta-like (DLL-1, 3, 4)) have been found in mammals. These homologous Notch receptors function as transmembrane heterodimers. Each Notch receptor consists of 3 parts, namely, the intracellular domain of Notch (ICN), transmembrane fragment, and the extracellular domain of Notch (ECN). The intracellular domain has an RBP-J kappa-associated module (RAM) domain and 7 ankyrin repeats. The activity of specific transcription factors is regulated by the RAM domain and ankyrin repeats of ICN. The intracellular domain also contains several nuclear localization sequences, a transactivation region, and a proline-glutamate-serine-threonine-rich region. The extracellular domain of Notch proteins includes 29-36 tandem epidermal growth factor (EGF)-like repeats, which are followed by the negative regulatory region with 3 cysteine-rich repeat regions and a heterodimerization domain . Modification of the extracellular Notch domain by binding of calcium ions, fucosylation, or glycosylation can increase the regulatory capacity of Notch. The ECN of the canonical and noncanonical ligands also include a few EGF repeats, which are more plentiful in the jagged-like ligands [16, 17]. The canonical Notch ligands are Delta/Serrate/Lag-2 (DSL) proteins, which share a conserved N-terminal region in the ECN necessary for receptor ligation and activation of Notch signaling. The DSL domain together with the amino terminal domain represents the EGF-binding domain region, which is essential for ligand interactions with specific Notch EGF-like repeats . The Notch ligands Delta-like 1(Dll1) and Jagged1/2 also contain EGF-like repeats, termed the Delta and OSM-11(DOS) motif, which functions to enhance ligand affinity for the Notch receptors. Despite lacking the DSL domain, Delta-like non-canonical Notch ligand 1 and 2 (DLK1and DLK2) also belong to the EGF-like family of membrane proteins and act as functional inhibitors of Notch signaling. In addition to DLK1 and DLK2, other soluble proteins can compete with the canonical Notch ligands Jagged1 and Dll4 for Notch receptor binding . The activation of Notch signaling can take place via either of two pathways; the non-canonical Notch signaling pathway and a more frequently used Notch-dependent processes called the canonical Notch signaling pathway (Figure 1). Activation of Notch signaling requires cell-to-cell contact through interaction of the Notch receptor and its ligand , which are expressed by the “receiver” cell and the “transmitter” cell, respectively. Sustained ligand-receptor interactions result in a switch where signal transmitting cells start expressing the receptors, and the signal receiving cells start expressing the ligands . The ICN is released from the cell membrane after it is cleaved by the γ--secretase complex containing presenilin, nicastrin, APH1 and PEN2. Subsequently, the ICN in a complex with DNA-binding proteins of the CSL (CBF1/RBPJ-kappa/Su (H)/Lag1) family is transported to the nucleus of receiving cells where it serves as a transcriptional co-activator. This activates the transcription of Notch target genes, including members of the Hairy and Enhancer of Split 1(HES1), and HES1-related (HESR1) families of basic helix-loop- helix transcription factors . These transcription factors control a number of cellular processes, including proliferation, differentiation, and apoptosis, which are deregulated in cancer development and progression [22, 23]. Published studies have alluded to the importance of the interaction between tumor cells and the tumor microenvironment and its role in the etiopathogenesis of HCC. The tumor microenvironment plays an integral role in modulating hepatic fibrosis, liver carcinogenesis, epithelial-mesenchymal transition, neoplasm invasion, and neoplasm metastasis [24, 25]. HCC is closely associated with liver fibrosis, with fibrotic or cirrhotic livers contributing to approximately 90% of HCC cases. This suggests that hepatic fibrosis is a crucial factor in the liver premalignant environment. Experiments in mice have shown that hepatic stellate cells (HSCs) contribute to over 90% of the hepatic myofibroblasts in fibrosis induced by biliary injury, hepatotoxins, or non-alcoholic fatty liver disease, demonstrating that activation of HSCs can mediate fibrogenesis . The major cell types found in HCC tumor microenvironment include immune cells, macrophages, fibroblasts, HSCs, endothelial cells, and cancer stem cells (CSCs). Macrophages are believed to be derived from monocytes and can further differentiate into tumor associated macrophages (TAMs). TAMs contribute to the development of tumors by releasing pro-tumorigenic cytokines . Notch signaling ligand Dll4 promotes pro-inflammatory activation of macrophages in vitro. Silencing of Notch1-4 by RNA interference attenuated Dll4-triggered expression of inducible nitric oxide synthase in human macrophages . Activated TAMs accelerate angiogenesis and hepatocarcinogenesis through multiple mechanisms. Additionally, density of TAMs is associated with large tumor size, advanced TNM stage, intrahepatic metastasis, disease recurrence, and poor overall survival in HCC patients . Cancer- associated fibroblasts (CAFs) can modulate the biological activities of HCC . The presence of CAFs is associated with HCC cell growth, metastasis, and intravasation. In turn, HCC cells stimulate CAF proliferation, suggesting that CAFs play a critical role in mediating the interaction between cancer cells and the tumor microenvironment . CAFs can secrete high levels of IL-6. This cytokine facilitates stem cell-like characteristics in HCC cells by activating Notch signaling pathway through STAT3 phosphorylation. Notch1 silencing may abolish the pro-tumorigenic effect of CAFs on HCC progression . More importantly, fibroblasts and macrophages can increase the tumorigenesis and malignancy of HCC due in part to Notch signaling-involved M1/M2 polarization of macrophages and the activation of HSC in liver fibrosis [33, 34]. HSCs are responsible for collagen synthesis in the liver ; HSCs are activated in response to the repeated liver damage and then trans-differentiated into myofibroblast-like cells. This transformation is considered as a key process in the development of hepatic fibrosis . Notch3 can regulate HSC activation in hepatic fibrosis, suggesting that selective interruption of Notch3 signaling may be a potential strategy to treat liver fibrosis . During liver fibrosis, activated HSCs trigger accumulation of the extracellular matrix and infiltrate the stroma of hepatic tumors situated around the fibrous septa, tumor sinusoids, and capsules. Therefore, HSCs may play a fundamental role in the progression of HCC . Additionally, HCC cells have been shown to promote the activation of HSCs in a rat model . The mRNA levels of Notch1 and Notch target gene HES1 was significantly reduced in the activation of HSCs . Furthermore, the interaction between activated HSCs and monocytes has been shown to promote the development and progression of HCC by enhancing HCC cell proliferation, migration and tumor sphere formation . Canonical Notch signaling pathway. Notch signaling is initiated by cell-to-cell contact allowing for interaction of Notch receptors and ligands. There are 3 major cleavage processes: S1 cleavage occurs in the trans-Golgi when a Furin-like convertase cleaves Notch receptors to produce heterodimeric receptors. Then, Notch receptors are transported to the cell surface of the receiving cell. When the extracellular domain of Notch receptor combines with its ligand, the Notch receptor is cleaved by a disintegrin and metalloproteinase domain-containing protein 10 (ADAM10), ADAM17 or TNF-α-converting enzyme (TACE) metalloprotease in S2 cleavage site, releasing an extracellular fragment. Afterwards, the remnant receptor is cleaved again by the γ-secretase complex in its transmembrane domain at S3 cleavage site, releasing the active intracellular domain of Notch (ICN). ICN translocates to the nucleus of the receiving cell and binds to the DNA-binding transcription factor CSL (CBF1/RBPJ-kappa/Su (H)/Lag1). 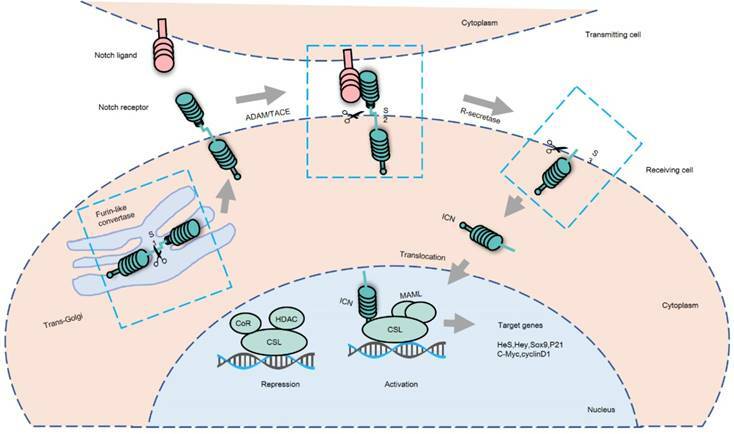 Thereafter, ICN competitively replaces the co-repressor (CoR) followed by the recruitment of the co-activator mastermind-like 1(MAML) to form a complex, initiating the transcription of CSL-dependent Notch target genes. The cancer stem cell (CSC) niche, which is concept unique aspect of the HCC microenvironment, actively participates in the growth of primary HCC tumors and HCC metastasis . CSCs, with their capacity for self-renewal and differentiation have been identified in HCC . Several cell markers of hepatic CSCs have been identified, including CD90, CD44, CD133, EpCAM, CD13, and CD24. Notch signaling has been shown to be associated with the recurrence of CSCs after radiation therapy, due to its involvement in CSC self-renewal . Notch signaling activity has been detected in isolated liver CSCs, which contribute to the heterogeneity of HCC . Additionally, Notch signaling activated by Jagged1 can enhance the cancer stem cell-like features of CD90- HCC cells, which demonstrate rapid G1/S transition phase after activation of Notch signaling . In liver development, liver progenitor cells as well as hepatoblasts, differentiate into two cell lineages: hepatocytes and cholangiocytes, which may lead to tumor formation by acquiring dedifferentiation-induced cancer stem cell-like features . Notch2 and Notch4 are implicated in the proliferation of hepatoblasts . Notch2 and Jagged1 facilitates liver progenitor cell differentiation into biliary epithelial cell. However, biliary differentiation is antagonized by hepatocyte growth factor, which promotes hepatocyte differentiation . Notch 2-expressing cells include bile duct epithelial cell precursors, indicating that Notch signaling participates in the formation of the bile duct in mice . Jagged1 is highly expressed in fibroblast in the portal region, suggesting that Notch signaling is activated and contributes to cholangiocyte differentiation . In normal liver tissue, Notch1, 2, and -3 were coexpressed on bile duct epithelium; however, with the exception of Notch3 in livers with primary sclerosing cholangitis, expression was absent from proliferating ductules in all disease states examined. This study suggested that Notch signaling may be important to normal bile duct formation . Additionally, cell proliferation of bile duct cells is induced by activation of Notch signaling, leading to the formation of bile canaliculi . It has been reported that genetic aberrations in Jagged1 can enhance HCC malignancy . Therefore, the development and progression of HCC is heavily impacted by the tumor microenvironment, suggesting that this interaction needs to be further explored. Aberrant Notch signaling is an important factor in HCC tumorigenesis and progression. Disrupted Notch genes are frequently found in HCC tissues in comparison to normal liver tissues. Four Notch receptors have been reported to be expressed in liver cancer cells, with varying sub-cellular distributions. Specifically, Notch1 and Notch4 were both expressed in the cytoplasm and nucleus, while Notch2 and Notch3 were expressed only in the cytoplasm. In comparison with non-tumor adjacent tissues, HCC tissues expressed a higher level of Notch1 in the cytoplasm and Notch4 in nucleus, and a low level of Notch2 in the cytoplasm. There was no significant difference between the expression levels of Notch3 and Notch4 . The heterogeneous expression pattern of Notch receptors has also been observed in another study . More than 80% of human HCC specimens demonstrate high Notch expression in comparison to the adjacent normal tissues . Notch1 signaling has been shown to facilitate HCC formation in a genetically engineered mouse models . A positive correlation has also been observed between the expression of Notch1 and the concentration of Alpha Fetal Protein (AFP); whereas there is a negative correlation between Notch1 expression and the degree of differentiation in HepG2 and QGY7701 hepatoma cells . Jagged1 expression and genome amplification was also associated with AFP value in clinical samples . Studies have shown that Notch1 gene expression is similar to the expression of Jagged1 in HCC, suggesting that the progression of HCC may be sustained by downregulation of Notch1/Jagged1 signaling . Yes-associated protein (YAP) is a transcriptional regulator, and overexpression of YAP promoted HCC development and progression by depending on Jagged1 to trigger activation of Notch-signaling in vivo . Hepatitis B virus X protein (HBx) can induce human hepatic L02 cell malignant transformation and activated Notch1 and Wnt/β-catenin signaling pathways. The L02 cell proliferation and activation of Wnt/β-catenin pathway were decreased by inhibition of the Notch1 signaling. The inhibition effect of knockdown Notch1 on proliferation and survival in L02/HBx cells was overcame by inhibition of the Wnt/β-catenin pathway. Therefore, Notch1 promotes HBx protein-induced hepatocarcinogenesis via Wnt/β-catenin pathway . Furthermore, HBx has also been found to contribute to HCC development through upregulating Notch target genes HES1 and JAGGED1 [60, 61]. Notch2 is a key regulator of self-renewal and tumorigenicity in human HCC cells, with genetic depletion of Notch2 impairing the tumor formation in vivo . In a study of human HCC samples, abnormally high levels of Notch3 and Hes1 were detected; higher expression levels of Notch3 in the tumor tissues may result in upregulation of HES1 gene expression . The Notch target gene Sox9 is expressed in multi-potent cells in the liver. Overexpression of Sox9 was frequently detected in patients with HCCs, and the Notch signaling pathway may activate via extending a pre-existing progenitor- like cell or giving the progenitor-like capabilities to differentiated cells during hepatocarcinogenesis [11, 64]. Therefore, the aberrant expression of Notch signaling closely correlate with liver oncogenesis. HCC is one of the most hypervascular solid neoplasms, in which angiogenesis plays a critical role in neoplasm progression. Angiogenesis also contributes to the high recurrence and disappointing survival rates associated with HCC . HCC's vascularity is unique and vastly different from the peripheral parenchyma of liver. Notch signaling acts as a key role in the process of vascular development, directly affecting vascular stability, differentiation of vascular smooth muscle cells, and arteriovenous formation . While 4 Notch receptors are expressed in the adult liver, only 2 key ligands of Notch signaling have been implicated in HCC angiogenesis, namely, Dll4 and Jagged1 . Notch1 is primarily responsible for angiogenesis and maturity of the vasculature, and Notch3 supports the maturation of vascular smooth muscle cells. However, the role of Notch4 in the formation of blood vessels has not been established. Dll4 is expressed in arterial endothelium during embryogenesis in mammals. High levels of Dll4 has also been observed in the endothelium of tumor blood vessels in comparison to neighboring normal tissue vessels . Notch1 expression is very high in primary HCC cases and distant metastasis, and vasculogenic mimicry structures have only been observed in HCC patients with metastasis. This study suggested that Notch1 may act on endothelial progenitor cells to initiate cancer angiogenesis . Hypersprouting and disruption of the vasculature has been associated with reduction in the expression of Dll4 . Dll4 allele deletion inhibited hepatic vascular alterations . Jagged1, which has been found to be implicated in early cardiovascular development via regulation of endothelial cells and vascular smooth muscle cells, can stimulate Notch-dependent angiogenesis in tumor cells [72, 73]. Notch1 can maintain hepatic sinusoid epithelial cell homeostasis, inhibit abnormal differentiation of endothelial cells, and prevent tumor carcinogenesis . Dll4 expression is also regulated by vascular endothelial growth factor (VEGF), and its expression in cancers is associated with VEGF expression levels . The level of angiogenesis regulators, VEGF-A and VEGF-R2 were significantly decreased in HCC tumor with inhibited Dll4 compared with the control group. Moreover, the inhibition of Dll4 expression in the tumor cells reduced the formation of new blood vessels in the tumor and cell proliferation . Intratumoral microvessel density in HCC xenograft mouse tumors was profoundly reduced by Livistonae chinensis seeds, and this anti-angiogenic effect mediated by significantly decreased expression levels of Notch, Dll4, Jagged1, VEGF-A, and VEGF-R2 . Additionally, the key mediators of Notch signaling, including Notch1, Dll4 and Jagged1, can serve as biomarkers of the inhibitory effect of Rubus alceifolius Poir on HCC angiogenesis in vivo . Dll4 and Jagged1 seem to play opposing roles in angiogenesis. Dll4 is thought to act on endothelial cells and restrict new vessel sprout formation in tumors. Tumor growth was suppressed by the inhibition of Dll4 in tumor endothelial cells through inducing non-productive angiogenesis . In contrast, Jagged1 expressed by tumor cells may engage Notch signaling in neighboring cells. Jagged1 can bind activated Notch1 to promote its expression by antagonizing Dll4 activity and enhancing VEGF activity. In turn, this effect stimulates tumor angiogenesis and promotes tumor growth, invasion, and metastasis . Antagonism of Jagged1 regulates the activation of Notch signaling mediated by Dll4 in stalk-cell, to increase the number and activity of terminal cells and promote angiogenesis. Thus, further studies are required to validate the effects of Dll4 and Jagged1 on angiogenesis in HCC, and to assess their potential as therapeutic targets in HCC. Notch signaling is not only critical to physiologic angiogenesis, but also correlated with tumor angiogenesis and metastasis. Despite the development of modern medicine and technologies adopted in HCC treatment, overall survival remains low due to high rates of intrahepatic and extrahepatic metastasis . Tumor invasion and metastasis consist of a series of discrete biological processes involving the complex interactions in tumor cells themselves, and between the host tissue and tumor cells. However, tumor cells must overcome a series of sequential rate-limiting steps in order to metastasize. The change in biochemical characteristics in tumor cells, including intravasation, arrest and extravasation, dormancy, angiogenesis, and metastatic colonization results in the transduction of abnormal signal, maintaining and promoting cancer invasion . The expression of Notch1 and Jagged1 is increased in HCC, and HCC tumor node metastasis (TNM) staging is significantly correlated with increased Notch1 mRNA levels. In comparison to patients TNM Stage I-II disease and those without tumor venous invasion, HCC patients with TNM Stage III-IV and tumor venous invasion, had higher expression levels of Notch1. Knockout of Notch1 by shRNA abolished Snail1 expression and effectively inhibited cancer cell motility in vitro and pulmonary metastasis. Finally, this study confirmed that Notch signaling affected the invasion and metastasis of HCC by the Notch1-Snail1-E-cadherin association . High Jagged1 copy number variation (CNV) was associated with advanced TMN classification and positive vascular invasion in liver cancer patients who had undergone surgical resection . In another study, downregulation of Notch1 in MHCC97H and HepG2 cells inhibited the invasion of HCC by upregulating the expression of phosphatase and tensin homolog (PTEN) and phospho-PTEN and downregulating the expression of focal adhesion kinase (FAK) and phospho-FAK . In H2O2 HCC cells and Stage II/III HCC tissue samples, upregulation of Notch1 induced a higher expression of Snail and enhanced the malignancy and invasiveness of HCC by cooperating with reactive oxygen species-induced activation of the phosphoinositide 3-kinase/ Akt pathway . Downregulation of Notch signaling caused by N-[N-(3,5-difluorophenyl acetyl)-L-alanyl]-sphenylglycine butyl ester (DAPT), a synthetic γ-secretase inhibitor, can also inhibit HCC cell invasion through the extracellular signal-regulated kinases 1 and 2 signaling pathway, which contributes to the down-regulation of matrix metalloproteinase-2 (MMP2) and -9 (MMP9) and VEGF. MMP2/9 and VEGF are key factors in invasion and metastasis of tumor in blood vessel formation . Additionally, suppression of Notch1 has been demonstrated to prevent HCC metastasis both in vitro and in vivo [85, 86]. Activated Notch2 has been detected in metastatic HCC, suggesting that Notch2 plays a functional role in HCC progression and metastasis . Notch4 has also been found to enhance the aggressiveness and metastasis of HCC . Furthermore, hypoxia, which is a common feature of HCC, can accelerate metastasis of tumor cells. Numerous factors are stimulated to participate in tumor invasion and metastasis in a hypoxic microenvironment. Hypoxia-inducible factor-1α and HBx were the factors that caused the elevated expression of Notch1-4 at both the protein and mRNA levels. Additionally, the overexpression of Notch3 was closely associated with the vascular invasiveness of HCC . Studies have suggested that anti-angiogenic therapy that blocks primary tumor growth with inhibitors of VEGF and platelet derived growth factor, may elicit resistance in these tumor cells and may paradoxically promote increased invasion and metastasis in mouse models [89, 90]. By inhibiting neovascularization in tumors, it is likely that anti-angiogenic therapy may result in clonal selection of tumor cells through upregulation of genes involved in survival and invasion. The possibility that Notch proteins may be functionally relevant in this setting is increased by the interaction between Notch signaling and hypoxic regulation of gene expression. However, more work is needed to further explore this relationship. HCC is a common aggressive neoplasm, with increasing mortality and poor prognosis. Notch signaling activated in human HCC samples accelerates liver cancer formation in mice, suggesting that a Notch signaling signature may be a biomarker of response to Notch inhibition in vitro . Higher expression levels of Notch3 has been shown to be consistent with shorter recurrence time and poorer overall survival in HBV-related HCC postsurgical patients . The roles of Notch1 and Notch3 in malignant transformation have been explored. Patients whose tumors had higher levels of Notch1 and Notch3 experienced poorer overall survival outcomes. Additionally, studies have suggested that Notch1 may be more crucial to HCC progression and metastasis than Notch3, due to Notch1 interaction with signaling pathways and correlation to HCC metastasis . Therefore, Notch1 may be a more relevant therapeutic target for HCC than Notch3. The activation of Notch2 can be enhanced by the cooperation of long noncoding RNA (lncAKHE) and YEATS4. In addition, higher expression of either Notch2 or lncAKHE in HCC patients has been associated with greater clinical severity and poorer survival rates [92, 93]. Overexpression of Notch1, Notch3, and Notch4 proteins have been observed in a total of 288 primary HCC patients who had undergone curative resection. Both Notch1 and Notch4 overexpression detected by immunohistochemistry showed an unfavorable correlation to disease-specific survival. Therefore, Notch1 and Notch4 have been identified as biomarkers of poor prognosis for HCC patients . Higher AFP levels was frequently detected in advanced and end-stage liver cancer clinical cases, and was connected with high Jagged1 CNV. Shorter overall survival was shown in higher Jagged1 CNV cases. However, even if AFP is not elevated and Jagged1 CNV is high, the clinical course is worse, earlier recurrences of liver cancer occur . HCC patients with overexpression of HES1 experienced longer median overall survival time in comparison to patients with low levels of HES1. However, the time to recurrence showed an inverse relationship with the expression of HES1 . The marker of biliary epithelial cells Sox9 is regulated by Notch signaling. Overexpression of Sox9 was correlated with lower 5-year disease-free survival and lower 5-year overall survival. Therefore, high levels of Sox9 was an independent factor for poor prognosis of HCC patients . According to extensive studies, the prognosis of HCC patients may be predicted by Notch signaling factors, such as Notch1, Notch3, Notch4, Jagged1, Hes-1, and Sox9. Increasing numbers of studies have shown that Notch signaling is associated with a disappointing prognosis in HCC. Therefore, Notch signaling may be a novel prognostic indicator for HCC patients. Currently, chemotherapeutic agents are used for treating HCC, but are only modestly effective because of significant non-selective cytotoxic side effects. Sorafenib is the only approved molecular-targeted agent for HCC, and this drug is widely believed to be a small multi-targeted tyrosine kinase inhibitor. However, the outcome of sorafenib-treated HCC patients remains disappointing. This highlights the need for novel therapies to be developed for HCC therapy. As previously mentioned, aberrant upregulation of the Notch signaling pathway is observed in HCC tissues. Consequently, downregulation of Notch signaling can inhibit HCC cell growth in vitro and tumor growth in vivo by Notch specific γ- secretase inhibitors [11, 95]. These studies indicate that targeting Notch signaling may be a potential novel option for HCC treatment, including the use of a single agent or a combination of anticancer agents. The activation of Notch signaling relies on γ-secretase activity. Thus, γ-secretase has become a promising target for Notch inhibition. γ -secretase inhibitors have been studied in various cancers, including HCC. Suppression of activated Notch signaling by γ -secretase inhibitors decreased cell growth and blocked tumor progression in SMMC7721 cells in vivo . RBP-J-interacting and tubulin-associated (RITA) protein can downregulate Notch-mediated transcription and may also be a potent antitumor agent for HCC therapy. It has been shown that RITA may inhibit tumor growth and induce apoptosis in HCC cells in vitro . In addition, Numb segregates asymmetrically and acts as a cell fate determinant, and can block the progress of malignant liver cancer by inhibiting the activation of Notch signaling . Therefore, it is possible that it may be a novel therapeutic target for HCC by promoting Numb-mediated endocytosis of Notch receptors. As have been reported, Notch receptors can be cleaved by ADMA17. ZLDI-8 (previously named as inhibitor of ADAM-17 compound No. 8 or IAC-8) was found to enhance the anti-tumor effect of traditional chemotherapeutic agents and sorafenib in HCC tumors in vivo or in vitro. Treatment of HCC cells with ZLDI-8 inhibited the activation of ADAM-17 and decreased the expression of 2 downstream proteins in Notch signaling pathway, namely, Survivin and cIAP1/2. Therefore, ZLDI-8 may be a promising therapeutic agent for HCC patients, particularly for patients with multi-drug resistance . Lidamycin (LDM), an anticancer antibiotic, has demonstrated distinct antitumor effects in liver cancer. LDM reduced the mRNA levels of Hes1, Hey1 and Notch1 genes. Additionally, the protein levels of Notch1, Notch intracellular domain, Hey1, and Hes1 were also decreased in LDM-treated in Huh7 cells. However, further clinical evaluation of LDM is required . The combination of different agents or treatment approaches is attractive for improving clinical efficacy. Co-delivery of platinum drugs and siRNA with Notch1-targeting micelleplex enhanced tumor control in the SMMC7721 xenograft model. This phenotype was due to the increased sensitivity of HCC cells to platinum drugs induced by siRNA-mediated inhibition of Notch1 . The anticonvulsant drug valproic acid, acting as a histone deacetylase inhibitor or a Notch signaling inhibitor, induced downregulation of Notch signaling by inhibiting Notch1 expression and its target gene HES1 in HCC. Additionally, the combination of valproic acid and the peptide-drug conjugate camptothecin-somatostatin resulted in more potent anti-proliferative effects on HCC cells in vitro than either single agent [101, 102]. Doxorubicin has reportedly been used to treat HCC with reduced Notch signaling. In vitro, the depletion of Notch3 by Notch3 shRNA can increase the expression of p53 and p27, decrease the expression of p21, enhance the uptake of doxorubicin, and improve cell apoptosis induced by doxorubicin. Therefore, the combination of Notch3 silencing and doxorubicin treatment can produce an enhanced antitumor effect in HCC cells by a p53-dependent mechanism . In addition, silybin, an antioxidant derived from the milk thistle plant, has been reported to exert antitumor effects. Notch1 siRNA (in vitro) or Notch1 inhibitor DAPT has been confirmed to enhance the antitumor effect of silybin in HCC HepG2 cells . Despite these promising preliminary studies demonstrating the antitumor activity of Notch-targeting combination strategies, further studies are needed to enhance the development of rational combination strategies to target HCC. Based on the studies discussed in this review, Notch signaling has a pro-tumorigenic role in HCC progression (Table 1). However, the role of Notch signaling in HCC is still controversial. Some reports suggest the opposite viewpoint that Notch signaling serves as a tumor suppressor in liver neoplasms [7, 8]. The conflict may be due to the highly context-dependent nature of the Notch pathway . In addition, HCCs exhibit various subtypes, including bi-phenotypic HCCs with combined hepatocellular and cholangiocarcinoma tumors, clear cell HCC, cirrhotomimetic HCC, fibrolamellar carcinoma, lymphocyte-rich HCC, scirrhous HCC, myxoid HCC, steatohepatitic HCC, sarcomatoid HCC, and granulocyte colony-stimulating factor HCC with major neutrophilic infiltrates . The relationship between Notch signaling abnormalities and HCC subtypes has not been well established. Therefore, more studies are needed to further investigate the precise role of Notch signaling in HCC subtypes. In summary, HCC is an aggressive tumor with poor prognosis and high mortality. Currently, the knowledge base demonstrates the activity and function of Notch receptors and ligands in the development and progression of HCC. Notch signaling has been demonstrated to regulate the HCC tumor microenvironment, tumorigenesis, progresssion, angiogenesis, invasion and metastasis, and prognosis. Notch signaling represents a potential therapeutic target in HCC. Points of therapeutic intervention may include 1) the expression of Notch ligands or receptors, 2) ligand-receptor binding, 3) γ-secretase-mediated cleavage of Notch, and 4) regulation of Notch activation. Importantly, the effect of cross-talk between Notch signaling and other signaling pathways (e.g., sonic hedgehog, TGF-β, PI3K/AKT, Wnt, mTOR, and Ras/Raf/MEK/ ERK) related to HCC cannot be ignored. Therefore, Notch signaling is a potential diagnostic and prognostic biomarker, and a promising target for HCC therapy. Additional studies are urgently needed to further investigate Notch signaling in HCC in order to foster the development of effective therapeutic approaches for HCC treatment. HCC: hepatocellular carcinoma; ICN: intracellular domain of Notch; ECN: extracellular domain of Notch; RAM: RBP-Jkappa-associated module; EGF: epidermal growth factor; DSL: Delta/Serrate/Lag-2; DOS: Delta and OSM-11-like; DLK1: Delta-like 1; DLK2: Delta-like 2; CSL: CBF1/RBPJ-kappa/Su (H)/Lag1; HES1: Hairy and Enhancer of Split 1; HSCs: hepatic stellate cells; CSCs: cancer stem cells; TAMs: tumor associated macrophages; CAFs: cancer associated fibroblasts; YAP: Yes-associated protein; HBx: Hepatitis B virus X protein; VEGF: vascular endothelial growth factor; TNM: tumor node metastasis; CNV: copy number variation; PTEN: phosphatase and tensin homolog; FAK: focal adhesion kinase; DAPT: N-[N-(3,5-difluorophenyl acetyl)-L-alanyl]-Sphenylglycine butyl ester; MMP2: matrix metalloproteinase-2; MMP9: matrix metalloproteinase-9; lncAKHE: long noncoding RNA; RITA: RBP-J-interacting and tubulin-associated; LDM: Lidamycin. This paper was supported by the National Natural Science Foundation of China (Grant No.81760851), Foundation of Guangxi University of Chinese Medicine (Grant No. P2012116), and Guangxi Science Research and Technology Development Project (Grant No. guikegong: 1598013-5). Corresponding author: Dr. Ailing Wei, Department of liver disease, the First Affiliated Hospital, Guangxi University of Chinese Medicine, 89-9 Dongge Road, Nanning 530023, Guangxi, China. Tel and Fax: 86-0771-3126658; E-mail: 100365edu.cn.